Life is better outside. As MEC members, we can all agree on that. Yet, as a society, we can spend too long inside, staring at the great outdoors from behind computers and windows. A 2017 Stanford University study ranked Canadians among the least active people in the world. The 2018 ParticipACTION Pulse Report found that 82% of the Canadian adult population isn’t active enough. And in a recent Nature Conservancy of Canada survey, nearly 90% of people said they felt happier and healthier when in nature, yet three-quarters said they found it much easier to stay inside. What if we could change this and go further to remove barriers and help more people find their place outside? What if we could help make Canada the most active country in the world? Your Co-op has come a long way since we awarded our first community grant in 1987, and we’re excited to introduce our community program that’s ready to stand (and run, climb, hike, bike and paddle) on its own. MEC All Out is the evolution of community programs at MEC. It wraps our community events and investments together into a single program that’s focused on connecting people to the places to go, the people to go with, and the skills they need to get there. MEC awarded our first-ever community grant to the Nature Conservancy of Canada. MEC became a member of 1% For The Planet. In addition to third-party certification of our giving, 1% For The Planet membership was a trusted way to let MEC members know that every purchase they made helped keep space for adventure in Canada. The events program launched! You likely know it as the MEC race series, century rides and festivals. These events have inspired hundreds of thousands of Canadians to get active outside (along with eating a lot of bananas along the way). MEC’s purpose is to make sure everything we do helps people get active outside, so our community team kicked off a strategy to make sure our partnerships and community investments lined up with that goal. After more than 30 years of community investments, your purchases at MEC have given more than $44 million to Canada’s outdoor recreation community. Thank you! Today, MEC’s community program is ready to take the leap and stand on its own as MEC All Out. Your purchases will continue to help conserve the places we play and support ways to get all of Canada active outside. We want to make sure that everything we do supports our mission to get people off the couch and out the door. That includes our community program, too – it’s how we reach people from Victoria to Halifax. 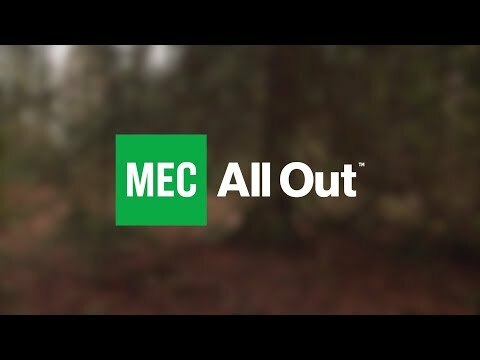 MEC All Out is our opportunity to shine a light on all the awesome ways MEC supports Canada’s outdoor recreation community. For years, MEC was a member of 1% For The Planet; they helped us build trust and awareness with our Co-op members that we were doing good stuff across the country. 1% For The Planet’s focus is to make sure their members contribute to environmentally-focussed initiatives. Environmental issues are still important to MEC. We’re continuing to invest in organizations and programs that protect the places where we play, but today, community at MEC is evolving. We’re still collaborating 1% For The Planet, but in a different way: instead of MEC being a member, we’re supporting 1% For The Planet’s goal to grow individual memberships in Canada. Together, MEC and 1% For the Planet can reach more people in Canada who are passionate about the environment, but aren’t sure how to turn that passion into action. If you want to learn more about becoming an individual member, check out how to make your pledge. For the first time, our community program will be able to measure how we’re doing against our purpose. MEC has teamed up with Imagine Canada’s Caring Company Program and the London Benchmarking Group Canada – the global standard in measuring community investment – to help us measure the impact of our community program as a whole. We’ll focus on things like how many people are getting active outside, and how many people are learning new skills and responsible recreation practices from MEC programs and partners. In the long term, we’ll measure the increase in Canadian activity levels with the support of our research partnership with Environics Research and our Canadian activity index – which will show us how we’re doing against our goal of making Canada the most active country in the world. Your purchases will keep helping conserve the places where we play and support ways to get all of Canada active outside. As a proud member of the Imagine Canada Caring Company Program, MEC will donate more than 1% of our pre-tax profits each year to the communities where we live and explore. What does that mean for members? Races, rides and festivals have been a huge hit, but they’re just the start. We want to find more ways for people to get outside. Watch for regional community calendars that bring in local and national partners for things like hiking trips with Parkbus, May long weekend kick-offs with Park Canada, and Bike to Work Day BBQs. To keep us accountable, we’re setting benchmarks to determine our impact and find ways to make our impact grow. Stay tuned for round one in 2020. Did you know that one of the perks of being an #mecstaffer is our volunteerism program? Every staffer gets 16 hours of paid time to volunteer with groups that support MEC values. Moving forward, we’re going to help more staff connect with partners and friends who are actively in need of volunteers. With 2,500 staffers across Canada, that adds up to a lot of time helping out in communities. Since 1987, MEC has contributed more than $44 million to Canadian outdoor recreation and conservation initiatives – and that’s all thanks to members. Every time you purchase something from MEC, you’ll be helping to conserve the places where we play and support ways to get all of Canada active outside. Your Co-op has achieved decades of great things, and we’re proud of the progress we’ve made. We couldn’t have done it without your support. Through MEC All Out, and our goal of making Canada the most active country out there, we’ll keep doing everything we can to make a positive difference in the world around us. Have an idea to get people active outside? Check out MEC community grants, expedition support and grassroots product donations. If it’s an initiative to help get Canada moving outside, we’d love to hear about it. Leads the MEC community team across Canada. Big on cycling, squeezing in lunchtime runs, hiking trails and keeping track of it all on Strava. Pronouns: she/her.